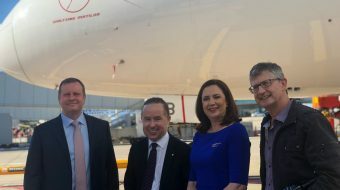 The Australian airline Qantas launches its first international Boeing 787 Dreamliner flights from Queensland this weekend with a daily service to Los Angeles and onwards to New York from Brisbane. The airlines says that four of the national carrier’s 787-9s are going to be based at Brisbane Airport, the service to Hong Kong is scheduled to start in December, with other destinations to follow in due course. Qantas Group CEO, Alan Joyce, basing the Dreamliners at Brisbane would bring new jobs to the airport, “We’ll have 120 cabin crew and pilots based in Brisbane to operate the Dreamliner flights and a further 350 indirect jobs are expected to be created as a result,” he said. Qantas last week announced its Brisbane International Lounge will be expanded to cater for an additional 100 guests and completed in early 2019 to support the growing demand for premium travel with the arrival of the Dreamliner.